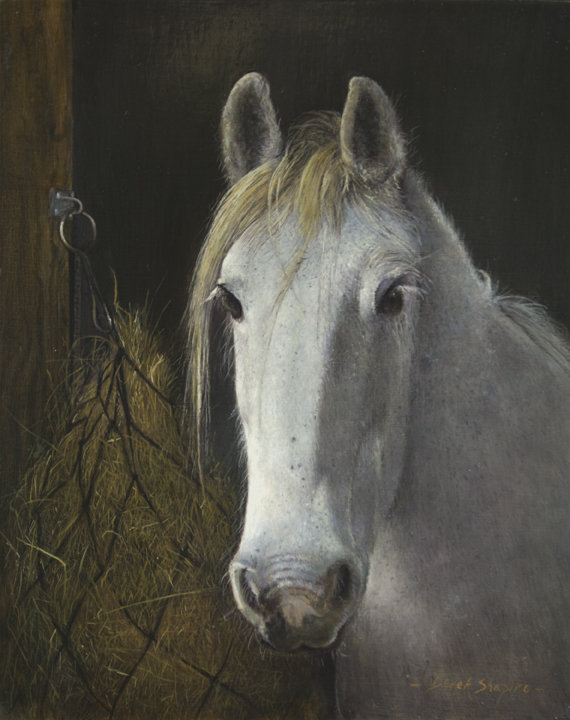 I found this horse in a stable block at the back of some farm buildings and decided it would make for a good painting. The horse was looking out over the stable door and looked as if it was taking in the landscape at the back of the buildings, perhaps thinking about the times she has galloped across the fields. I kept the painting for some time in my collection and eventually sold it to the owner of the horse. It transpired that the horse called Rosie M, was the daughter of the Hunt Master that owned the farm and she used to ride it in the local hunt. 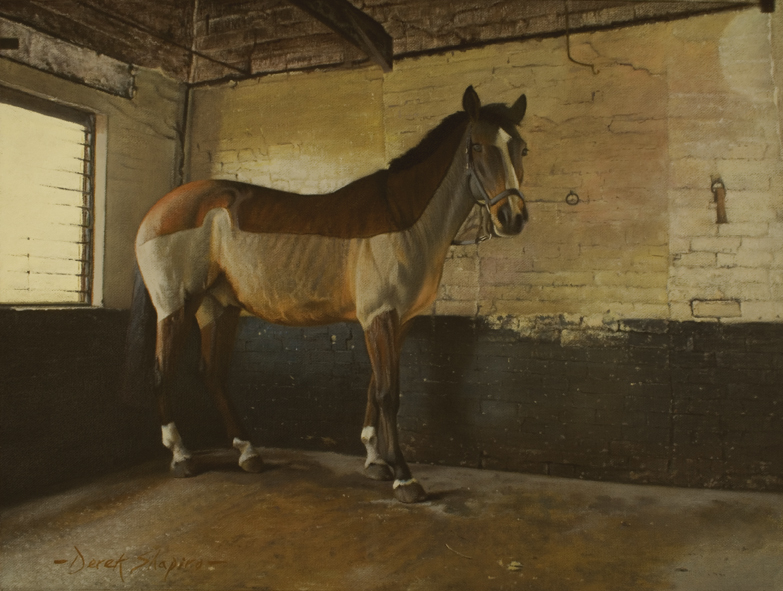 An oil painting of a horse at the North Staffs Hunt stable in the tack room being prepared for tack. Posthumous paintings are always a little more tricky to do. It is essential in most cases to meet the subject one paints in order to achieve the character, mood and something of the personality of the animal in question. In the case of a landscape, depending on the elements, one sets out to capture the atmosphere of the view. The client who commissioned this painting is from East Anglia, and after seeing my work on Facebook asked me if I would paint her beloved horse that passed away sometime ago. If you would like to commission a painting, posthumous or otherwise, then please get in touch here. Scenes like this are seldom seen and I was extremely fortunate to find such a chance and put it to canvas. I came upon this scene while’st out walking at a place called Rodney’s Pillar. Rodney’s Pillar is set on a hilltop in Montgomeryshire about a mile from the boundary with Shropshire. The hilltop rises to 900 ft and at the top give spectacular 360 degree views across Shropshire, Cheshire and Wales. You can follow a path, open to the public, which takes you through woods on both sides and leads up to the hilltop. There is also pheasant shooting during the season and from October to January access is closed to the public on a shoot day. 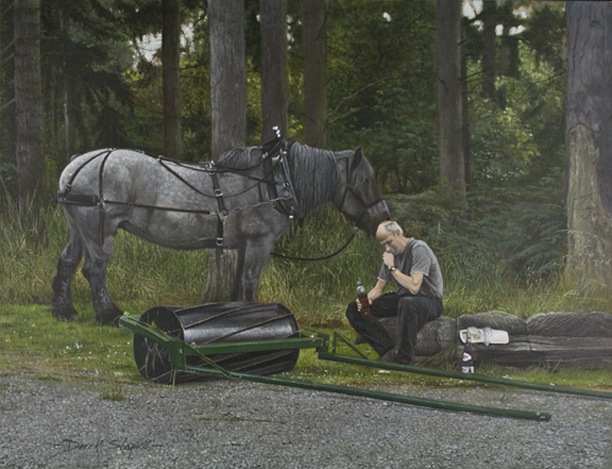 The woodsman in the painting was having a lunch break prior to which he had been working his blue roan, Dutch Draft mare, which was flattening bracken in the woods. 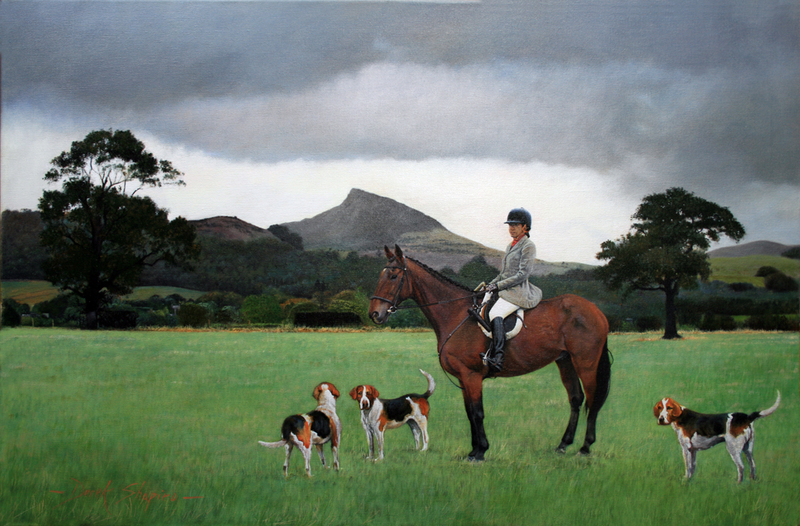 Here a commissioned painting of a member of the Cleveland Hunt. Rose Berry Topping can be seen in the background. Rose Berry Topping is an iconic hill situated on the edge of the North York Moors. One of the few places, deep in a forest, where the heavy horse is still used today. I think you will agree, much more picturesque than tractors! 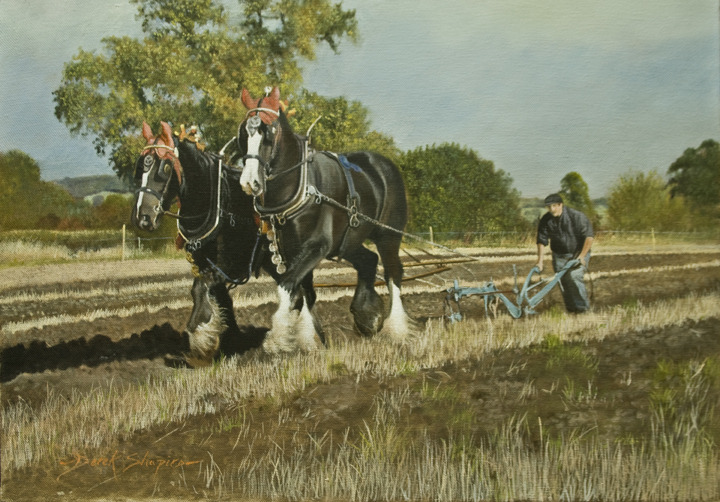 I just love these gentle giants that used to plow the fields in bygone days. I often think I was born in the wrong period for past times always make for more pleasing paintings, especially if you are a traditional painter.